(CNN) -- The top U.S. commander in Afghanistan wants more troops and a new strategy -- but most importantly, he wants to win the battle for the hearts and the minds of the people in the war-torn country. Gen. Stanley McChrystal says the U.S. will fail in Afghanistan without more troops. "What I'm really telling people is the greatest risk we can accept is to lose the support of the people here," Gen. Stanley McChrystal told CBS's "60 Minutes" in an interview aired Sunday night. "If the people are against us, we cannot be successful. If the people view us as occupiers and the enemy, we can't be successful and our casualties will go up dramatically." McChrystal is expected to send his request any day for more resources to combat the insurgency in Afghanistan, according to a senior U.S. defense official familiar with the situation. Earlier this month, McChrystal warned that more troops are needed there within the next year, or the nearly 8-year-old war "will likely result in failure," according to a copy of the report obtained by The Washington Post. Former Secretary of Defense William Cohen said McChrystal is basically saying the U.S. strategy and tactics to date have been, in fact, "creating more animosity, more insurgents than we've been winning." "We can't win the war or be successful with a campaign in Afghanistan without the support of the Afghan people. We can't get the support of the Afghan people unless we show we're going to be successful," Cohen said Monday on CNN's "American Morning." And if the U.S. wants to win hearts and minds, "You have to pursue Gen. McChrystal's strategy. If you say that's not acceptable and costs too much, it takes too long, we don't have our allies -- then you come up with a counterterrorist strategy, which means you're going to start killing people and thereby risk killing a lot of innocent civilians, thereby creating more insurgents." Now that McChrystal has given his assessment to the administration, President Obama is left with two choices, said Cohen, a Republican who served in President Clinton's administration. "So the political side of things, the civilian leaders now have a choice. 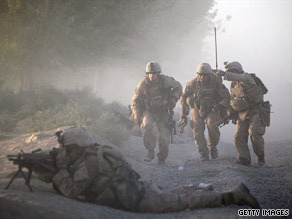 They can say we agree with Gen. McChrystal, here are more troops, or we disagree, and we need to change the strategy. So those are the choices that face the president," he said. Secretary of Defense Robert Gates said Sunday that the administration is in the process of evaluating its strategy, and once it is confident the strategy is right, it will address the question of additional resources. Asked whether Obama has a choice to turn down a request for more troops -- given that top leaders in the military, including Adm. Michael Mullen, chairman of the Joint Chiefs of Staff, have said more troops are needed -- Gates replied, "I think the president always has a choice. He's the commander in chief. Obama has called Afghanistan a "war of necessity," and he's sent an additional 21,000 troops there, but he's also said he has to "exercise skepticism" any time he sends a man or woman in uniform into harm's way. On Monday, White House spokesman Robert Gibbs told reporters a decision on McChrystal's request was "a number of weeks" away. "We're going through the process of assessing where we are, what's changed, what needs to happen, where we need to go," Gibbs said, later adding: "We have seen the movie before, where you put a bunch of resources in a place and then you decide your strategy. I don't think the output that we've seen in those decisions has all together been good for this country or for our military." Some helping to shape the strategy support counterinsurgency, which would involve a large number of troops focused on fighting the Taliban, plus efforts to rebuild the country and its economic system. Others favor a counterterrorism strategy in which a limited number of troops would target only al Qaeda. Other top Democrats have also expressed opposition to deploying more troops. In an editorial in the Wall Street Journal, Sen. John Kerry, D-Massachusetts, warned against rushing to judgment. "In the coming weeks, President Barack Obama will make the most difficult choice a commander in chief can face: whether to send more troops into harm's way," wrote Kerry, the chairman of the Senate Foreign Relations Committee. "Before we send more of our young men and women to this war, we need a fuller debate about what constitutes success in Afghanistan." Going ahead, Obama needs to address the nation and explain to the American public why Afghanistan is important, Cohen said. "Why are we in Afghanistan? Why does it matter? What is the mission? What are the costs? Are we willing to bear them and for how long? And are any allies with us, and how long are they going to be with us? "These are all questions he has to address, persuade the American people it's in our national security interests to do this, and then commit the resources necessary to carry it out," he said. CNN's Chris Lawrence and Barbara Starr contributed to this report.